I still have several pieces of Heathkit gear, not beacause I'm sentimental, but because they work well. I have a Heath signal generator that, when used with my very accurate and modern frequency counter, is an excellent FG for amateur bench work. I have a Heathkit VTVM that is very accurate and I still use it often. I also have an old Heathkit AM-1 SWR bridge, it has been updated with matched hot carrier diodes and one percent resistors, making it a very accurate and useful tool in the shack. There are still plenty of bargains to be had on Heathkit test equipment, and if you know what you are doing you can wind up with a very fine piece of equipment. 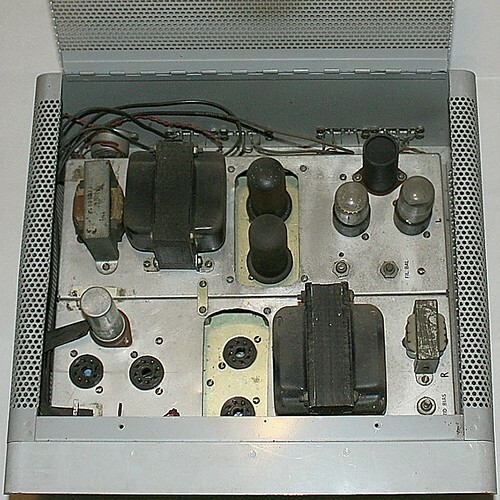 Most of the stuff that Heathkit made was very high quality and easily repairable. Too bad the new Heathkit is failing so miserably, selling ten dollar digital clocks and junky crystal radio sets for a hundred dollars is not a business model for success. W5INC, N2EY and WD4IGX like this. It occurs to me that I don't read much, if anything, from the "computer mainframes that took up a city block" crowd getting all excited over vintage gear. Maybe I just don't hang out in the right circles. I used to collect vintage computer equipment. Then I remembered why I quit collecting anything when my home started turning into a trash heap and I got rid of everything except what I use. I have far too many hobbies to collect things. My hobbies by themselves create organizational / storage issues. 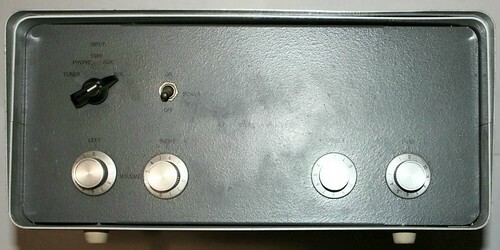 Then, in the mid 70s, I was tired of using underpowered noisy junk, and assembled a coupla Southwest Technical Products "Tigersaurus 250" amplifiers (link). Connected to a coupla efficient horns, they're PLENTY loud. KE4OH and W5INC like this. if anything, from the "computer mainframes that took up a city block" crowd getting all excited over vintage gear. I'm guessing that there are a few Forum members here, including myself, were raised that you actually repaired what you had already, if it was possible. A penny saved was a penny earned? Whatever went wrong in my house growing up, my Dad would fix it himself and would never call the repair guy to come over. Independence is still a good thing to have isn't it? Today's "consumer" America doesn't like this idea, as you just buy a new doo dad when the old 1 goes South. With the vintage gear you have a chance of repairing it and the parts are usually still available to do so. If I won the lottery I would go out and spend 15K on the new 70th Anniversary Mcintosh tube amp that just came out without a problem. But since that hasn't happened, I will look for a more cost effective way, to upgrade the old stereo system here at the QTH. I have all of the needed tools to overhaul an older tube stereo amp already. So no cost outlay there in obtaining more tools to fix a new addition to the shack. Basic tube amp design is the same as it was 50 years ago and the old Heath amps once updated are very good pieces. Are there better newer amps out there on the market today? I am sure there are but why not go "green" and recycle a older piece of gear that is still top notch in what it was designed to do, if possible? The Right to Repair movement is a great thing in my mind and I am glad to see the "maker / fixer" ranks getting filled up by mostly folks in the younger generations. We have created a environmental disaster waiting to happen consumerism here in the USA, along with other Countries around the Globe. The Right to Repair movement will help in solving that problem, along with giving folks hands on knowledge of repairing things for themselves. A win win here? KC8VWM, N8ZL, W5INC and 1 other person like this. Those never had the kind of appeal that vintage radio gear does for many of us. I can't really explain why, but they don't. Maybe in part because we never really owned those OURSELVES as a hobby. We might have worked with them (well I used a PDP 11/70 in college) but we certainly didn't own one. Radio was magical in its earlier days and still retains some of that for many of us. Plus, radio gear was something hobbyists could and did actually own, often even built themselves and even more often could and did service or upgrade and modify themselves. No disagreement from me on that. I'm of the same mentality. I see now, said the Blind man! Those boxes do evolve rather quickly, I reckon. Yes - IF the thing is repairable, and IF you have the skills, tools, time, and materials. A lot of ifs. Today's "consumer" America doesn't like this idea, as you just buy a new doo dad when the old 1 goes South. Depends entirely on the situation. Stuff wears out, becomes obsolete. Parts are not free, and are often unavailable. And when you fix it, how long before something else on it fails? With the vintage gear you have a chance of repairing it and the parts are usually still available to do so. For a price. Some time back I replaced an over-the-stove microwave oven/vent fan unit because the parts to fix it cost more than half the price of a new one. Was that wrong? If I won the lottery I would go out and spend 15K on the new 70th Anniversary Mcintosh tube amp that just came out without a problem. But since that hasn't happened, I will look for a more cost effective way, to upgrade the old stereo system here at the QTH. I have all of the needed tools to overhaul an older tube stereo amp already. So no cost outlay there in obtaining more tools to fix a new addition to the shack. Basic tube amp design is the same as it was 50 years ago and the old Heath amps once updated are very good pieces. Are there better newer amps out there on the market today? I am sure there are but why not go "green" and recycle a older piece of gear that is still top notch in what it was designed to do, if possible? If you have the parts, time, tools, info, etc. - sure. But not everyone does. Maybe. But....there's another side: increased prices for consumer stuff. 1) One big reason for repair in the past was that stuff was expensive. Look at what Heathkits cost and then adjust for inflation.....none of it was cheap. 2) Another big reason for repair in the past was that stuff broke down a lot, needed constant maintenance, wore out. Not so much today. 3) Heathkit got started in electronics kits because they were able to buy enormous quantities of WW2 surplus parts for pennies per pound. That's why many 1950s Heathkits use such odd tubes and circuits - they were designed around what they had. 4) Heathkit often used custom transformers for which there is no standard replacement part - you'll only get a replacement from another Heathkit. They did this to discourage others from copying their products, and to force repair folks to get their parts from Heathkit. - Radio-TV repair shops were everywhere....because they were needed. - Many of remember when we'd get old TVs off the trash or the alley behind the TV repair shop and use them for parts. Many were not all that old; they'd simply gotten to the point where they were not worth fixing. - In 1960, a typical American car went from showroom to junkyard in about 7 years. Their odometers only went to 99,999.9 because few of them made it even that far. Yes, some went a lot further - but most didn't. Major failures were common - worn-out rings and valve guides, transmission failure, cracked frame, cracked block or heads, bearings, suspension parts, major body rust that could not be stopped, and more. Most cars needed several tuneups (points plugs condenser rotor, oil and filter change, dwell and timing and carb adjustment) per year, to keep running well. Tires might last 20-25,000 miles if you were lucky. There were also all sorts of minor maintenance and failure items - hoses, belts, brake shoes, suspension, water pump, generator, power steering, exhaust system, bearings, etc. - that would go bad, often at the worst possible times. (And this was when cars were much simpler!) Often a car went to the junkyard not because it was unfixable but because it would cost more to fix than the price of a good used car a couple of years newer. Today, most cars are MUCH higher quality and MUCH more reliable. Whole bunch of reasons for that, ranging from better lubricants to pollution controls to better materials to foreign competition to years of emphasis on safety.